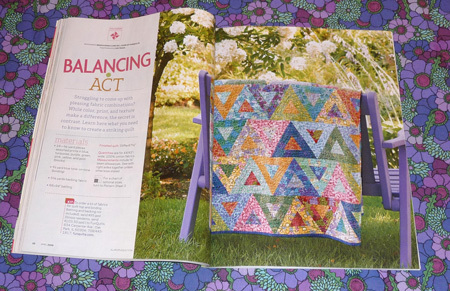 We’re thrilled with the beautiful shots of our Balancing Act quilt in the April issue of American Patchwork & Quilting Magazine. The quilt shown is made with fabric from our Wild Bunch line of hand-drawn botanicals. 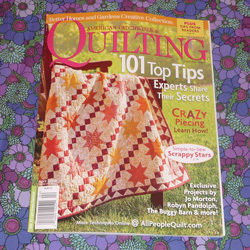 This is an exceptionally good issue I think because it has 101 tips from well-known quilters from modern to traditional so readers get multiple opinions on various techniques. Also check out their website for lots of free patterns and video tutorials. I’m so excited to see Wild Bunch in action! I *love* this line! Saw this in AP&Q, and have marked it as a keeper! Great work, love the colors! I loved the look of Balancing Act and have starting putting one together from the pattern in the magazine. There seems to be one important oversight in the instructions. Pay attention to the two sides of the inner triangle that are cut across the grain. You get a better result if you stitch those 2 sides first (that is, attached to sides B & C of the large triangle). This leaves the longest side of the large traingle(D) to be sewn to the side that is cut ‘with the grain’. This order will make for less stretching and distortion of the triangle. We’ve made several versions of this quilt and have never experienced the stretching or distortion in piecing that rainbowtabby is referring to but it could be attributed to differences in sewing machines or sewing feet. We’ve found that using a walking foot when piecing with fabrics that are cut off-grain prevents distortion too. If you have problems though, this seems like a good resolution.